Very nice three song release. 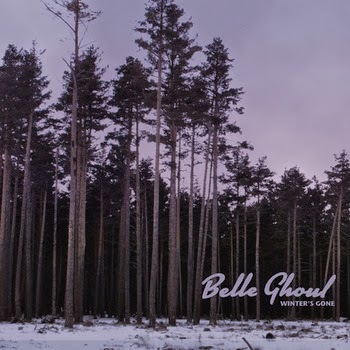 “Rabbit's Moon & Doomsday” was BELLE GHOUL’s 10” white vinyl Mini-LP that Elefant Records released at the end of last year. The group - formed by Christopher Tait (ELECTRIC SIX), Jesse Paris Smith (the daughter of Patti Smith and Fred “Sonic” Smith from MC5), Matt Van, Zach Shipps and Mike Alonso - now gives us “Winter's Gone”, a new Digital Single taken from that splendid Mini-LP, that is also accompanied by an incredible video. “Winter's Gone” is a magical song that said goodbye to a winter that lasted almost five months, which Nur Casadevall has transmitted quite clearly in the video; it reflects the wintry coldness, both formally and internally, of a savage encounter between a girl and a wolf. It’s a kind of winter’s tale full of fantasy, and it was filmed in the famous Casa Gomis, also known as “La Ricarda”, and probably the best architectural example of Catalan Rationalism. The rest of the songs included on this Digital Single were taken from the group’s show on December 30th, 2013 in Webster Hall in New York, when they opened for Patti Smith herself. “Around For The Weekend” is especially solid, effusive, euphoric; a hit that multiplies itself in its live format, with super catchy keyboard lines and a great chorus. To wrap things up, “(Out Of) The Neighborhood” reminds us of the BOO RADLEYS with its brilliant trumpets and sunny melody. They say that the live show is the definitive test for a lot of groups. Since we don’t have them on Spanish stages, these two songs will have to be proof of the fantastic sound and energy in the group’s live shows.